IIBA® Ottawa-Outaouais Chapter is pleased to host a full-day workshop, "Plan and Monitor to Succeed", as part of the Chapter’s growing Skills™ Workshops and Masterclasses - a professional development series designed specifically for BAs by BAs. This full-day workshop covers the Business Analysis Planning and Monitoring Knowledge Area and associated techniques in BABOK® v3. Content of each task in the knowledge area is described and the practical application of this knowledge area is reviewed. To complement the theory, interactive exercises are provided to help reinforce your learning. Note: Pre-reading material will be emailed to participants a few days prior to the workshop. Please register with an email address that you are able to check for updates prior to the workshop. PDs and CDUs: 7 CDUs/7 PD hrs - The event is recognized for Professional Development hours (PD Hours) for the certification application, and Continuing Development Units (CDU) for recertification. Parking: Parking is available in the building via Slater Street entrance (between Kent and Lyon Streets), and across the street on Kent. The Centre is located along the OC Transpo Transitway, Kent Street bus stop. Workshop doors open at 8:15 a.m. Morning session 9:00 a.m. to 12:00 p.m. Afternoon session 1:00 p.m. to 4:00 p.m.
Breakfast, lunch, coffee and tea will be provided. To register for this workshop, please use the Register Now button to purchase tickets on the Eventbrite page. About the facilitators: Nancy Beatson, CBAP, is an accomplished business analyst with over 20 years of experience working in business and technical domains. For the past 15 years she has been honing her business analyst skills on simple and complex, multi-disciplinary projects that have helped her clients address their business needs and solve their problems. She thoroughly enjoys working with stakeholders and other business analysts to help them achieve success! 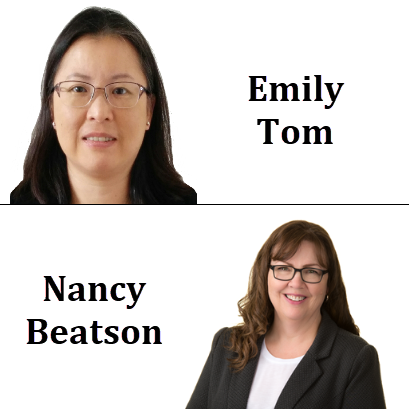 Emily Tom, CBAP, is the current President of the IIBA Ottawa-Outaouais Chapter. As a consultant, she has been practicing business analysis for various private- and public-sector clients for over 15 years. She is passionate about business analysis and helps others learn and grow into the BA profession.